An anonymous letter circulating in Anderson suggests Grimes County Sheriff Don Sowell used inmate labor on his personal property, but Sheriff Sowell says the inmates were clearing a tree that had fallen over a public roadway. From what I was told by my jailer, Glen Love, that supervises the outside inmate work crew on details around the county, the tree “on” my property had blown over and many limbs were on W. Buffington St. and the unnamed city road that divides my property and the property of Tom Johanson. He said that he moved it because it was blocking the two roadways. He said they had to cross the barbed wire fence to use the chainsaw to cut at different angles and that was the only time they were on my property inside the fence. He said they loaded up and took the limbs to the burn pile that is located on the Law Enforcement Center property adjacent to firing range. That’s about all I can say about this as I said earlier, I didn’t know about this until you brought it to my attention. Judging from the photograph, however, it appears that the tree was blown away from the roadway and into the pasture rather than toward the roadway. Why does it matter? As the letter notes, a public official commits a crime if he or she “misuses government property, services, personnel, or any other thing of value belonging to the government that has come into the public servant’s custody or possession by virtue of the public servant’s office or employment.” See Texas Penal Code §39.02. The letter was copied to the FBI and the Texas Rangers, among others. Major Jeffrey Collins of Texas Ranger Company A in Houston told me the Rangers will not investigate unless the district attorney requests the investigation in writing, per Texas Department of Public Safety policy. I faxed a letter to Grimes County DA Tuck McLain before Christmas asking for a response, but I haven’t heard from him (nor am I surprised by that). Unless someone contacts the grand jury directly, I doubt the matter will ever be investigated. I’ve received other reports that I’m investigating, but I’m trying to tread carefully because we’re in the middle of campaign season. 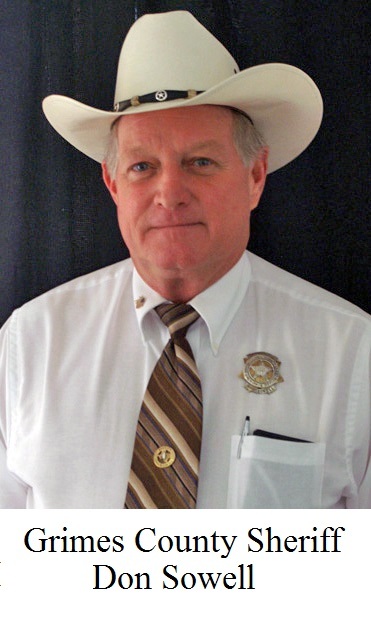 The sheriff is being opposed by Shawn Sayers in the March 1 Republican primary, but I know who sent the anonymous letter, and it was not Mr. Sayers. If you have information about whether inmates were working on the sheriff’s property, please send it my way. I’ve been on hiatus for a few months, but fear not. I plan to have a big post tomorrow about John Paschall, Booger County, and an FBI agent who is asking questions about Hearne’s city finances. You can receive notice of new posts by entering your email in the box to the right of this post. NOTE: Reader comments are not appearing in Firefox browsers, but they are visible in Chrome browsers. I’m not sure why. I’d like to thank everyone who has left kind words, we appreciate it on behalf of my family. This insane post has hurt me personally to the core. If anyone knows the area and my family property (which if you didn’t, you do now since our property records and information have been blasted online – all which I do not appreciate one bit) you will know that our small piece of property is basically a fishbowl, surrounded by city and county owned roads. When a tree falls on a city road, heaven forbid a foot is placed on our property. It is my mom, the mayors, responsibility to make sure it is cleared as it fell on city road. So our apologies that people got offended that the team that could help fix this matter that day (so my sweet mom didn’t have to lift a tree all by herself) happened to need to use our property to ensure all was cleared as naturally, some fell over into our ditch as well. I am highly disappointed in these crazy accusations, but always proud of and stand by my family and my father. I am truly blessed to have been raised by this wonderful man who has instilled the best morale and character in me. He has and always will truly love serving each and every citizen of our county. We appreciate all of the support we have gotten. I BELIEVE THIS 100%%… Reason being is that Anderson county is full of b.s and think they can get away with anything…im doin nights in that jail & have been for a whole year. I WAS SENTENCED TO 90DAYS JAIL by judge Shiflett and agreed to weekends…when i got to jail i later realized that the jail had on their paperwork i was sentenced to 120..WHICH IS NOT WHAT THE JUDGE TOLD ME…i contacted everyone i was told..and no one will contact me back…i even WROTE DON A LETTER 2 MONTHS AGO AND STILL NO RESPONSE..SOOO YES HE IS GUILTY.. I wanted to see if the picture actually shows inmates, etc because I do not believe the accusation and the link does not work. I think this is baloney and it’s a weak attempt to start a rumor. Anyone who knows anything about Sheriff Sowell knows to ignore this. The accusation smells fishy to me. Our sheriff is a great man, no law biding citizen in this community has ever complained about him. He has the respect of his officers and the community. He does a lot for this community. I support him 100%. As for ur little comment of the election and Sayers, thank you, now everyone knows what type of person he is, and funny how in all those pics not one Grimes County offender in them all or of a Grimes county vehicle. If the Sherriff says it was blocking the road and he wasn’t aware offenders were out there then I believe him. Also, how stupid are you? You don’t put pics and maps of where county officials live on the Internet, I hope you are held accountable if anything happens on his property, because if it was mine I would be suing you for placing my property and family in danger like that. You know offenders do hold grudges against cops, and they normally don’t stay in prison forever. Idiot. I think you are nit-picking here. Find something else to complain about. I have heard nothing but praise about the sheriff. Also is this Sayers the one who was fired by Brazos Constable for causing a big problem in Washington DC. ?